Let's get started by creating a blank Flow and setting the trigger. The trigger in this case is a "Recurrence" which will be set to run at 9am daily with a start date that means when implemented, it will run like clockwork on the hour. Note: The start date is in this format – 2019-03-20T09:00:00Z. If your in a non UTC timezone the "Z" at the end will not be required. 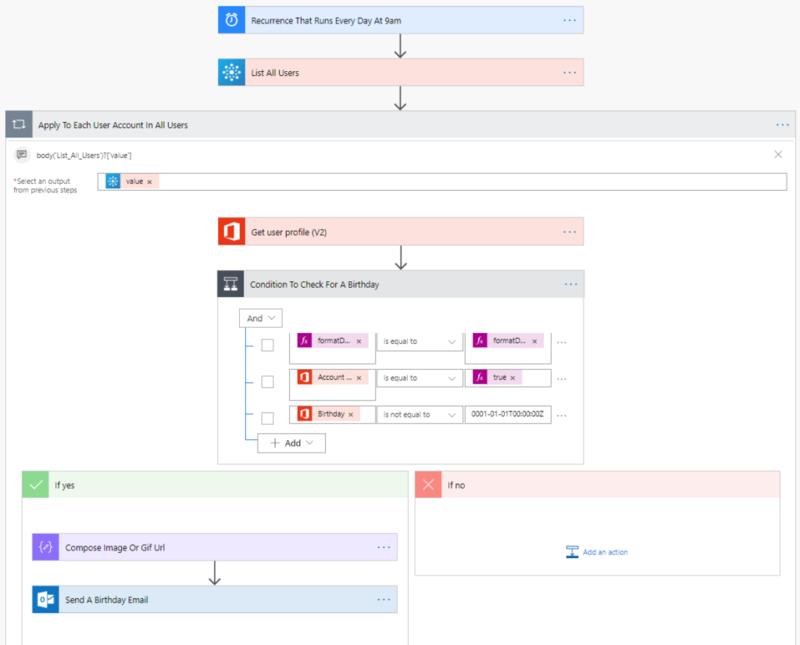 We then use the "List group members" action from the "Office 365 Groups" connector. I have named it "List All Users" by click the elipses (…) in the top right. 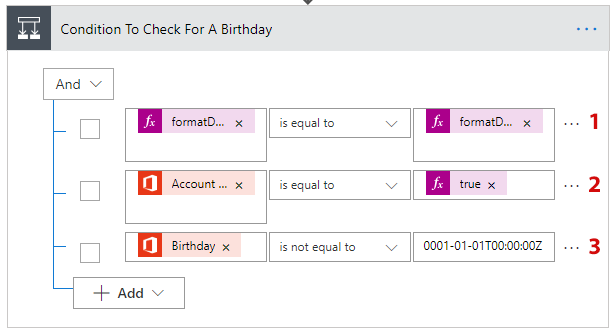 As there are likely multiple users in your organisation then we will need to set an "Apply to each" to allow us to iterate through each one checking to see if it is the user's birthday or not. We will call it "Apply To Each User Account In All Users". Time to use the "Office 365" connector and the action called "Get user profile (V2)". The next step covers the all important condition. 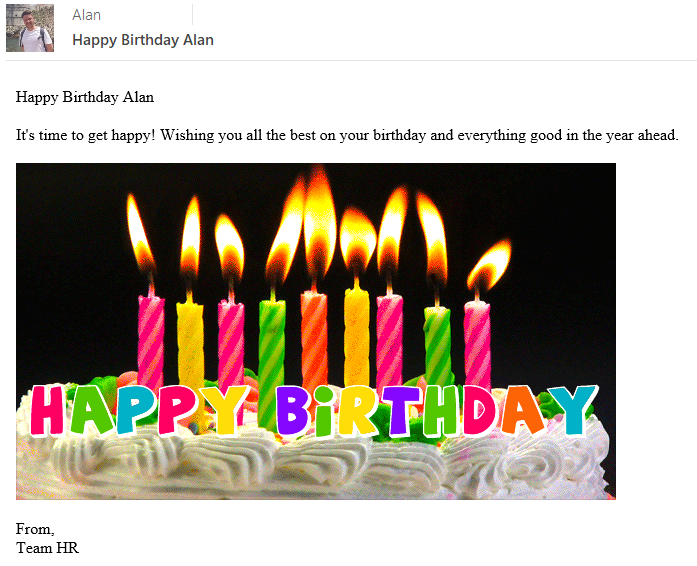 It checks if it is the user's birthday and it makes sure the group member is set to "enabled". No need to be wishing those disabled accounts (leavers or shares) a Happy Birthday. There is no need for the No branch in this Flow as it will run successfully with no output if no-one has a birthday on that day. We now use the above web based url in the email body with the "Send an email" action. This means if you want to change the image you can. 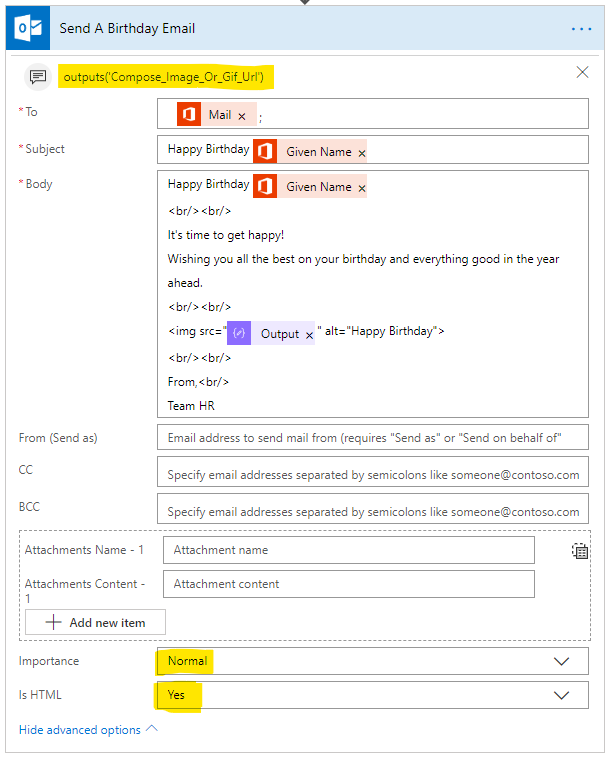 So there we have it, you now have a neat Happy Birthday process that targets any group in Office 365.